John Gulbransen, Associate Editor of The Sky-Writer, wrote '30' to his 'newspaper career at the NAS Pasco this week with his detachment to the Receiving Ship, PSNY, Bremerton. 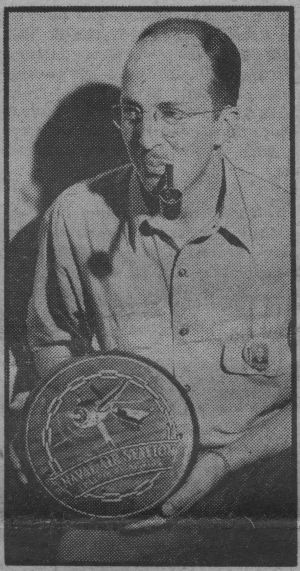 Gulbransen, a Painter first class, was the last remaining original member of The Sky-Writer staff, arriving on the Pasco scene to organize the paper in the latter part of 1942. A former Seattle newspaperman he served with the Seattle Star for two years and The Seattle Times for eight years prior to his entrance into the Naval service. While serving in an editorial and art capacity with The Sky-Writer, Gulbransen created many cartoon characters which will live in the station history, namely "Johnny Kretzpas" and "Elmer McBlurp." It was Gulbransen's artistry that created the official station in­signia which was recently approved by the Chief of Naval Operations. Last Monday morning he received a Meritorious Mast from Captain J. E. Shoemaker, who commended Gulbransen for his excellent work while stationed here.